Data on the pathogens responsible for nosocomial bloodstream infection (BSI) and their antimicrobial resistance (AMR) in Hubei province are limited. This study was conducted to determine the major pathogens causing BSI and to characterize their AMR. 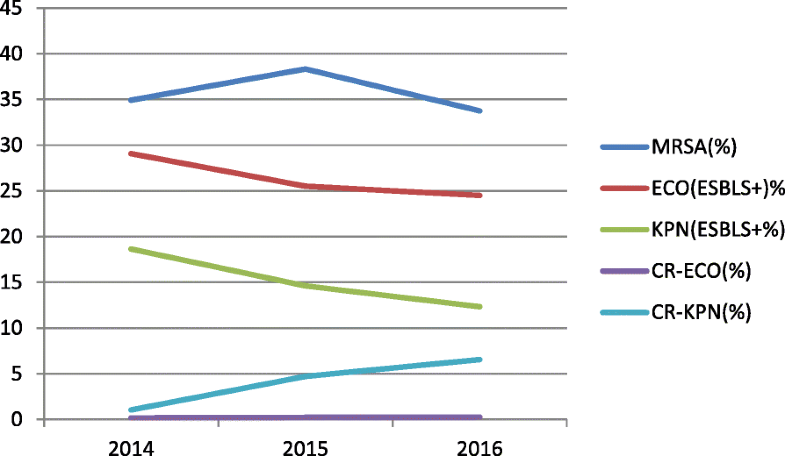 Data from the China Antimicrobial Resistance Surveillance System (CARSS) from 2014 to 2016 were analyzed retrospectively. Escherichia coli, Staphylococcus aureus and Klebsiella pneumoniae were the most common pathogens responsible for nosocomial BSI. 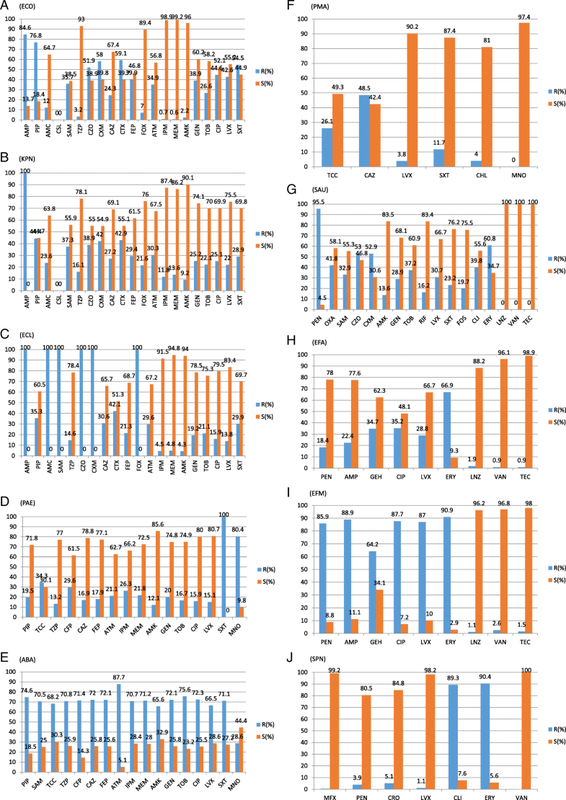 Individuals aged 0–5 years and ≥ 40 years old were the major demographics at risk of infection by E. coli, K. pneumoniae, Pseudomonas aeruginosa, Acinetobacter baumannii and Enterobacter cloacae, while individuals aged 0–5 years were the major demographic at risk of infection by S. aureus, Enterococcus faecalis, E. faecium, Streptococcus pneumoniae and Stenotrophomonas maltophilia. The frequencies of E. coli and K. pneumoniae isolates resistant to cefotaxime were 59.1% and 24.3%, respectively, and the frequencies of resistant isolates to ceftazidime were 42.9% and 27.2%, respectively. 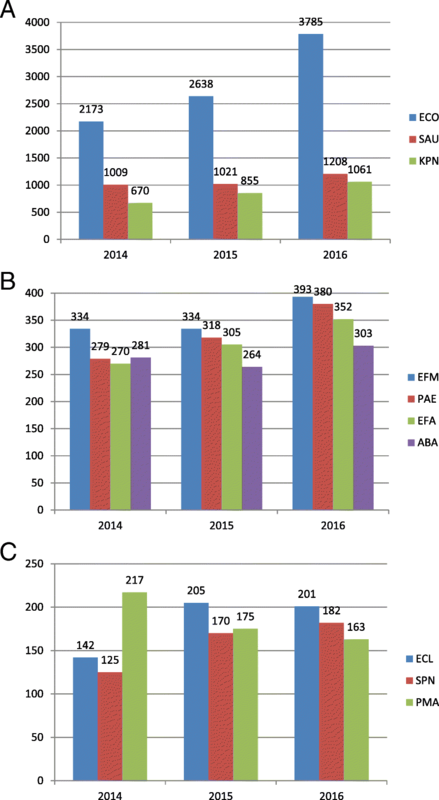 From 2014 to 2016, the frequency of extended-spectrum β-lactamase (ESBL)-positive E. coli declined from 29.07 to 24.5%, and the frequency of ESBL-positive K. pneumoniae declined from 18.64 to 12.33%. The frequency of carbapenem-resistant (CR) E. coli was below 0.5%, but 1–10% of K. pneumoniae isolates were CR. The emergence of methicillin-resistant S. aureus and the expansion of ESBL and fluoroquinolone resistance among Gram-negative Enterobacteriaceae increased AMR severity. Carbapenemase-producing K. pneumoniae isolates responsible for nosocomial BSI increased year over year and effective infection control measures should be taken to prevent them from spreading. Bloodstream infection (BSI) is very common and is associated with high morbidity and mortality worldwide. The etiology of BSI and the antimicrobial resistance (AMR) of the pathogens causing it differ significantly between developed and developing countries . 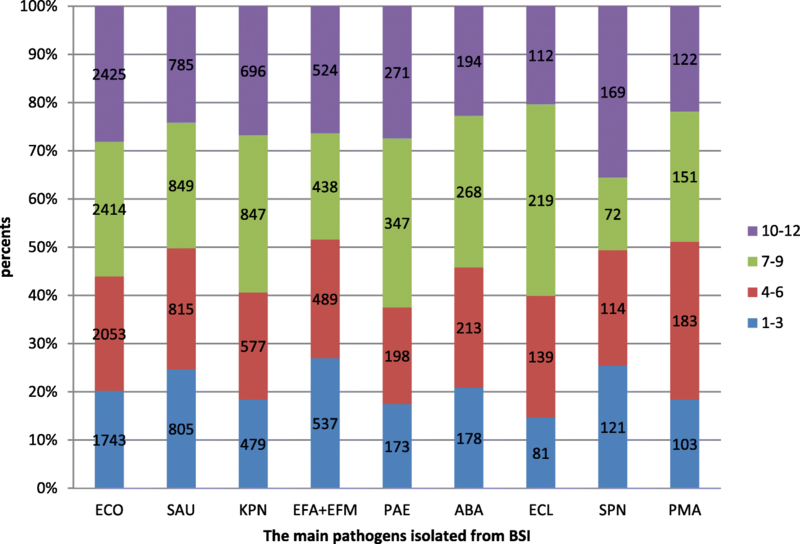 Data from the Finnish Hospital Infection Program during 1999–2001 and 2005–2010 demonstrated that the most common pathogens responsible for BSI were coagulase-negative Staphylococcus, S. aureus and Escherichia coli . By contrast, BSI surveillance in Malawi from 1998 to 2016 indicated that non-typhoidal Salmonella, S. enterica Typhi and Streptococcus pneumoniae were the most common causative agents . In China, the pathogens responsible for BSI vary from region to region. A study of the clinical features of nosocomial BSI in neonates from two prefectures, Henan and Chongqing, indicated that E. coli was the most prevalent BSI pathogen in Henan while Klebsiella pneumoniae was the predominant BSI pathogen in Chongqing . Reports on the causes of BSI in Hubei province have been limited. Surveillance and analysis of AMR are crucial in preventing BSI. The Hubei Province bacterial resistance surveillance network was founded in 1998 and includes surveillance data on hospital-acquired and community-acquired infections. By the end of 2016, a total of 11 secondary care hospitals and 41 tertiary care hospitals had joined the network, covering all prefecture-level cities in Hubei Province (Fig. 1). Here, in order to provide a basis for empirical treatment and policy making for the Department of Health Administration, we reported BSI surveillance data over the last three years, from 2014 to 2016. We undertook a retrospective surveillance study of nosocomial BSI in Hubei province. The data were derived from the China Antimicrobial Resistance Surveillance System (CARSS). Hospital-acquired, nosocomial, and health care-associated infections were defined according to the World Health Organization (WHO) as infections occurring in a patient residing in a hospital or another health care facility, in whom the infection was not present nor incubating at the time of admission . An infection occurring 48 h or later after admission to hospital was considered nosocomial . An infection occurring within 48 h of admission to hospital or not associated with healthcare interventions within the previous 12 months was defined as community-acquired . If the isolates were identified as coagulase-negative Staphylococcus, Corynebacterium, Bacillus, Propionibacterium or other potential skin contaminants, two or more separate blood cultures were required for diagnosis . Blood samples (8–10 mL for adult patients and 2–5 mL for pediatric patients) were collected into special blood culture bottles. Various automated blood culture instruments were applied. Manual biochemical tests, automatic bacteria identification instruments and/or an IVD-MALDI Biotyper (Bruker, Germany) were used for identification of bacterial species. The Kirby-Bauer method and/or the minimum inhibitory concentration (MIC) method were used for antimicrobial susceptibility testing according to the Clinical and Laboratory Standards Institute (CLSI) guidelines. The results of antimicrobial sensitivity tests were interpreted according to the CLSI 2016 standards . Isolation and identification of strains and antibiotic sensitivity testing were performed by members of the bacterial resistance monitoring network. Each member of the monitoring network reported data regarding bacterial identification and antibiotic sensitivity to the CARSS each quarter. Antibiotic susceptibility data was analyzed using WHONET 5.6 software. Only the first isolate of a given species from a patient was analyzed according to CLSI M-39 . When antibiotic resistance tests were carried out by the Kirby-Bauer method, the MIC method and the E-test method simultaneously, the results of E-tests were preferred, followed by the MIC method and the Kirby-Bauer method. In this investigation, only strains isolated more than 100 times per year were analyzed. E. coli was the most common pathogen responsible for nosocomial BSI during 2014–2016, followed by S. aureus and K. pneumonia. Each of these pathogens was isolated more than 500 times per year (Fig. 2a). Enterococcus faecium, E. faecalis, Pseudomonas aeruginosa and Acinetobacter Baumannii isolated were each isolated between 250 and 500 times per year (Fig. 2b). Enterobacter cloacae, S. pneumoniae and Stenotrophomonas maltophilia were each isolated between 100 and 250 times per year (Fig. 2c). Individuals aged 0–5 years and ≥ 40 years old were the major demographics at risk of infection by E. coli, K. pneumoniae, P. aeruginosa, A. baumannii and E. cloacae, while individuals aged 0–5 years were the major demographic at risk of infection by S. aureus, E. faecalis, E. faecium, S. pneumoniae and S. maltophilia (Fig. 3). Most E. coli isolates were identified from October to December (10–12) and from July to September (7–9), with the lowest number identified from January to March (1–3). Isolates of S. aureus, E. faecalis and E. faecium were distributed roughly evenly across all four seasons. The highest number of K. pneumoniae, P. aeruginosa, A. baumannii and E. cloacae isolates identified in a quarter was 7–9 and the lowest number of these species was 1–3. Most S. maltophilia isolates were identified from April to June (4–6) and the lowest number observed in a quarter was 1–3 (Fig. 4). For E. coli isolates, resistance rates to ampicillin (AMP), piperacillin (PIP), cefazolin (CZO), cefuroxime (CXM), cefotaxime (CTX) and trimethoprim sulfamethoxazole (SXT) were > 50%, but more than 89% of isolates were sensitive to imipenem (IPM), meropenem (MEM), piperacillin-tazobactam (TZP), amikacin (AMK) and cefoxitin (FOX) (Fig. 5a). K. pneumoniae isolates were naturally resistant to AMP, and resistance rates to all other antibiotics except for PIP were > 50% (Fig. 5b). E. cloacae isolates were naturally resistant to AMP, PIP, CZO, CXM, FOX and ampicillin-sulbactam (SAM), but > 50% of isolates were sensitive to the other antibiotics (Fig. 5c). P. aeruginosa isolates were naturally resistant to SXT, and the resistance rate to minocycline (MNO) was 80.4%. However, > 60% of isolates were sensitive the other antibiotics except for ticarcillin-clavulanate Acid (TCC) (Fig. 5d). More than 65% of A. baumannii isolates were resistant to common antibiotics except for MNO (Fig. 5e). Sensitivity rates of S. maltophilia isolates to SXT, MNO, levofloxacin (LVX) and chloramphenicol (CHL) exceeded 80% (Fig. 5f). More than 50% of S. aureus isolates were resistant to penicillin (PEN), erythromycin (ERY), CZO and CXM (Fig. 5g). More than 60% of E. faecalis isolates were sensitive to common antibiotics except for ERY and ciprofloxacin (CIP) (Fig. 5h). For E. faecium isolates, sensitivity rates to vancomycin (VAN), teicoplanin (TEC) and linezolid (LNZ) exceeded 95%, but resistance rates to other antibiotics exceeded 60% (Fig. 5i). For S. pneumoniae isolates, resistance rates to ERY and clindamycin (CLI) exceeded 89%, but sensitivity rates to other antibiotics exceeded 80% (Fig. 5j). The frequency of methicillin-resistant S. aureus (MRSA), extended-spectrum β-lactamase (ESBL)-positive E. coli and K. pneumoniae, and carbapenem-resistant (CR) E. coli and K. pneumoniae were analyzed during 2014–2016. The proportion of MRSA isolates ranged from 30 to 40%, ESBL-positive E. coli isolates ranged from 20 to 30%, and ESBL-positive K. pneumoniae isolates ranged from 10 to 20%. The frequency of CR-E. coli was below 0.5%, but CR-K. pneumoniae isolates were detected at a frequency of 1–10% (Fig. 6). Our surveillance data indicated E. coli, S. aureus and K. pneumoniae were the most common pathogens responsible for nosocomial BSI in Hubei province from 2014 to 2016. For common gram-positive bacteria and S. maltophilia, individuals < 5 years of age were the major demographic at risk of nosocomial BSI. By contrast, for common gram-negative bacteria except S. maltophilia, individuals < 5 years of age and ≥ 40 years of age were the main demographics at risk of BSI. Resistance of E. coli isolates to common antibiotics was more severe than K. pneumoniae isolates, especially to third-generation cephalosporins and fluoroquinolones. ESBL production by E. coli isolates was more common than in K. pneumoniae isolates. Most P. aeruginosa isolates (> 60%) were sensitive to antibiotics, while most A. baumannii isolates (> 60%) were antibiotic-resistant. E. coli, S. aureus and K. pneumoniae were the most common pathogens responsible for BSI according to our surveillance data. These results differed from reports in European and African populations, in which coagulase-negative Staphylococcus and non-typhoidal Salmonella were the predominant causative agents of BSI (in Finland and Malawi, respectively) [2, 3]. This may be due to the distinct social, economic and environmental factors in these regions. The spectrum of pathogens responsible for BSI is highly variable both geographically and temporally . Timely analysis and reporting of local AMR resistant isolates is important for infection control. The most common pathogens responsible for BSI are different in people of different ages . Our study found that individuals aged 0–5 years old were an important demographic at high risk of BSI. It has been well established that children under 5 years of age are susceptible to infection by Salmonella and other intestinal pathogens . Our findings indicated that children under 5 years of age were also the main demographic susceptible to BSI. For Gram-positive bacteria (S. aureus, E. faecalis, E. faecium, and S. pneumoniae) and S. maltophilia, individuals under 5 years of age were the major demographic at risk, while individuals above 40 years of age or under 5 years of age were the primary population at risk of infection by Gram-negative bacteria (E. coli, K. pneumoniae, E cloacae, P. aeruginosa and A. baumanni). Our findings indicated that the incidence of E. coli and K. pneumoniae BSIs was highest in elderly patients older than 40 years, consistent with global data . The prolongation of human life and the aging of populations in society maybe have something to do with increasing rates of BSI caused by E. coli and K. pneumoniae. It was reported that BSI by Bacillus cereus had a seasonal tendency with increased risk of infection during the summer . Our data showed that S. pneumoniae was more often isolated in winter while K. pneumoniae, P. aeruginosa, A. baumanni, and E. cloacae were most prevalent in autumn. No obvious seasonal trend was observed for S. aureus, E. faecalis and E. faecium. Whether BSIs have seasonal trends like food-borne diseases is worth further study. The frequency of ESBL-producing E. coli and K. pneumoniae isolates has been increasing worldwide, resulting in prolonged hospital stays, increased costs, reduced rates of clinical and microbiological responses, and poor outcomes for patients and healthcare systems [14–20]. Previous studies have analyzed the relationship between mortality rate and ESBL-producing pathogens and observed an association with KP-BSIs, although this finding remains controversial [16, 21–23]. The frequency of ESBL-producing E. coli and K. pneumoniae isolates decreased year by year from 2014 to 2016 according to our surveillance data. This finding may be related to the strategies implemented by the USA CDC for controlling the transmission of MDR bacteria such as quarantine of patients with MDR infections, strict hand disinfection by medical staff, routine disinfection of medical devices and limited use of specific antibiotics. For E. coli, resistances rate to the third-generation cephalosporins CTX and CAZ were 59.1% and 24.3%, respectively; ESBL may be the main cause of resistance, especially for bla(CTX-M) isolates. The molecular epidemiology of E. coli isolates causing BSI in Shanghai during 2011–2013 demonstrated that CTX-14, CTX-55 and CTX-15 were the most common β-lactamases . By contrast, bla(SHV) and bla(CTX-M) were the most common β-lactamases in K. pneumoniae isolates . MDR and the increase in infections caused by Gram-negative bacilli producing ESBL have contributed to intensive use of carbapenems . 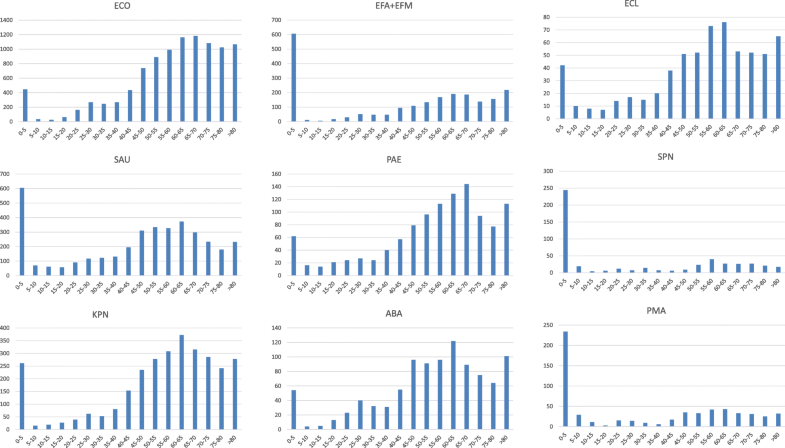 Data from the European Survey on Carbapenemase-Producing Enterobacteriaceae in Europe (EuSCAPE) indicated that the incidence of carbapenemase-producing (CP) E. coli and K. pneumoniae (CP-E/K) isolates in hospitals increased from 0.124 per 1000 admissions in 2013 to 0.223 per 1000 admissions in 2014 . Our data showed that CP-E/K isolates are a growing risk, especially CP-K. pneumoniae. In our surveillance data, S. aureus was the most frequently observed Gram-positive pathogen responsible for BSI. MRSA is a worldwide issue associated with significant morbidity and mortality . Our data showed that the frequency of methicillin resistance among S. aureus isolates was 30–40%,consistent with a study conducted in 26 Hong Kong public hospitals between January 2010 and December 2012 , In the United States and Europe, multiple infection control approaches have been tested to control the spread of MRSA. These approaches included strict contact precautions including single rooms for MRSA-colonized or -infected patients, targeted admission screening for high-risk patients and healthcare workers at risk for infection, molecular typing of all MRSA strains, and routine decolonization of MRSA carriers including healthcare workers [28, 30, 31]. Measures to control MRSA transmission should be carried out strictly according to the principles of infection control. This study had several limitations. In our surveillance data, only nosocomial BSI was analyzed and community-acquired BSI was not included. 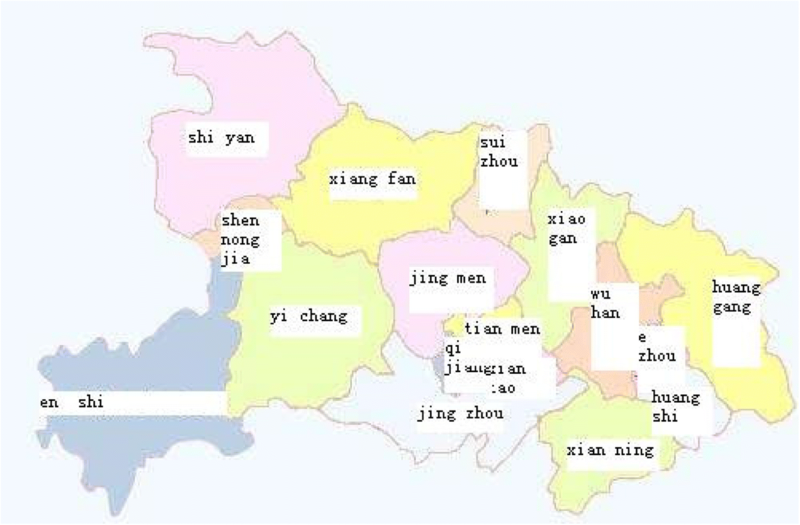 In Hubei province, the characteristics of community-acquired BSI are mostly unknown. The molecular mechanisms of MDR, especially ESBLs and carbapenemases, have not been tested. Molecular epidemiological studies need be carried out in the future. Our findings indicated that E. coli, S. aureus and K. pneumoniae were the most common pathogens responsible for nosocomial BSI in Hubei province. Individuals aged 0–5 years were the major demographic at risk of infection by S. aureus, E. faecalis, E. faecium, S. pneumoniae and S. maltophilia, while individuals < 5 years of age or ≥ 40 years of age were primarily at risk for E. coli, K. pneumoniae, P. aeruginosa, A. baumanni and E. cloacae infection. Antibiotic resistance testing showed that MDR isolates such as MRSA and ESBL-produced E. coli and K. pneumoniae species were still a serious concern. It was particularly noteworthy that the frequency of CR-KPN isolates was increasing significantly over time. We thank all of the members of HuBei Province bacterial resistance surveillance network. We thank Liwen Bianji, Edanz Editing China (www.liwenbianji.cn/ac), for editing the English text of a draft of this manuscript. This work was supported by research grants from the National Mega Project on Major Infectious Disease Prevention (2017ZX10103005–007). The funders had no role in study design, data collection and analysis, decision to publish, or preparation of the manuscript. LT designed the study. ZZ did the statistical analysis. LT wrote the manuscript. ZS were in charge of the laboratory work. All authors read and approved the final manuscript. Lei Tian and Ziyong Sun were from Department of Clinical Laboratory, Tongji Hospital, Tongji Medical College, Huazhong University of Science and Technology, Wuhan,Hubei Province, China. Zhen Zhang was from Department of Pharmacy, Tongji Hospital, Tongji Medical College, Huazhong University of Science and Technology, Wuhan,Hubei Province, China. The study protocol was approved by the Tongji Hospital ethics committee for research in health. The Tongji Hospital ethics committee also approved the waiver of informed consent to participate in this study due to its retrospective design. All patient data were anonymised prior to the analysis.